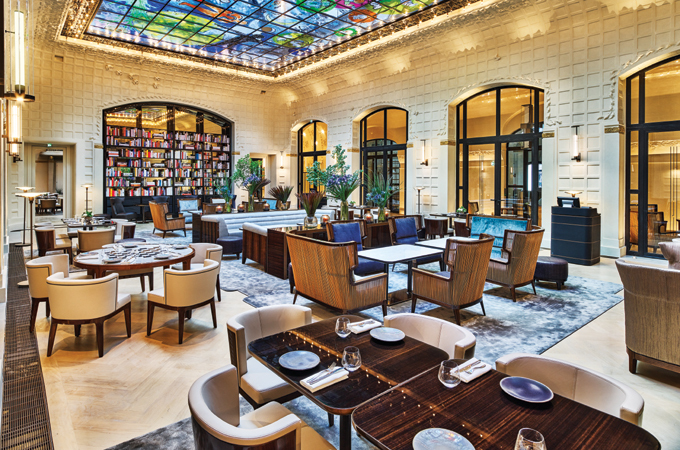 Lutetia, acquired by The Set, has re-opened its doors in Paris this July 12 and everything has been reinvented, from the design and interiors to the gastronomy and service. Located at 45 Boulevard Raspail, in the St.Germain-des-Pres area of the Left Bank, the hotel originally opened in 1910 by the Boucicaut family, founders of Le Bon Marche. The Set, the name behind Hotel Café Royal in London and the Conservatorium in Amsterdam, is known for its sensitive and transformative restoration of historical properties. Lutetia was closed four years ago for an ambitious period of restoration and refurbishment that has returned the property to its rightful place amongst the city’s palace hotels and as the only grand hotel on the Left Bank. Lutetia has 184 keys, spread over seven floors, including 47 suites; significantly reduced from the original total of 233, allowing for larger rooms. Seven signature suites, including a two-bedroom presidential suite and two penthouse suites with private access to terraces as large as 70 sqm and boasting an unrivalled 360-degree view of Paris will be the crown jewels of this renaissance. The opening will also bring to light the Bar Josephine, the Salon Saint-Germain, the Orangerie, a lounge and open-air courtyard - a new addition to the hotel and the Salon Crystal, all under the stewardship of Executive Chef, Benjamin Brial. In addition to these spaces, and in keeping with its history as a landmark in Saint-Germain society, in September the famous Lutetia Brasserie will be reopened under the care and attention of Gérald Passedat who currently holds three Michelin stars in France. One of the most defining features of the rejuvenation of this legendary landmark is the creation of the Akasha Holistic Wellbeing Centre, a 700 sqm spa. Six treatment rooms will offer a huge array of the most sophisticated treatments and massages, a sauna, steam room, plunge pool, infinity edge Jacuzzi and large fitness room with state-of-the-art equipment will also be available. Bathed in natural light, a rarity in Paris, the 17-metre long swimming pool completes the experience.